Meadows Museum director Sean FitzGibbons (left) in Paris. SHREVEPORT, LA — Centenary’s Meadows Museum of Art will host an exhibition of original artwork and literature created and curated by students participating in the 5th annual Centenary in Paris program. The one-night-only exhibition is Saturday, August 25, from 3:00 to 6:00 p.m. and is free and open to the public. Students enrolled in the “Bohemian Vision: Reframing Paris” course with Bruce Allen, professor of art, and Sean FitzGibbons, director of the Meadows Museum, will be tasked with creating the exhibit after they return from Paris on August 17. Centenary in Paris is an immersive international academic experience offered to all first-year students. 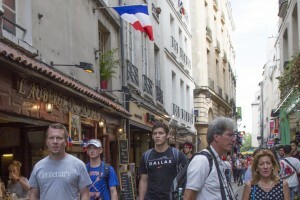 Students in the Class of 2022 departed for Paris on August 9 and have been exploring art, beliefs and values, film, STEM, African-American literature, history, and creative writing, all through the filter of French culture. Students will continue the work for these courses after their return from Paris on August 17, earning four credit hours through Centenary’s August immersive term preceding the traditional fall semester. FitzGibbons is excited to see how the exhibit takes shape in a short time frame. More information about the Centenary in Paris program is available at centenary.edu/paris.